The Client Access server role has continued to develop with the advent of Exchange Server 2013. In this session we cover proxy and redirection in a mixed world of Exchange 2007, 2010 and 2013, discuss how proxy health checks work, discuss load balancing, and more. If you’ve ever heard anyone describe CAS 2013 as ‘just a proxy’, or listened to people that dare to say ‘DAGs are all that matter’ then bring them along too and lead them into the light, after all, you know that without the CAS no-one can access their mailbox in 2013…. Exchange Server 2013 offers many enhancements for redundancy, availability, and recovery. This session focuses on the improvements in the areas of storage, high availability, site resilience in Exchange Server 2013. It includes details on new storage features, enhancements to lagged database copies, the introduction and integration of managed availability, database availability group network enhancements, namespace changes, site resilience, and datacenter failovers. Exchange 2013 introduced some significant architectural changes from prior releases, and as a result, the process for sizing an on-premises deployment has changed as well. 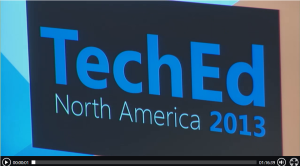 In this session, we review the performance impact of the 2013 architectural changes and major new features and discuss the recommended methodology for sizing. Come learn about how the Transport Architecture works in the new Exchange. This session covers the new transport services of front end transport and mailbox, how delivery group mail routing works, and how to ensure your data is protected in transit with the new Exchange Server 2013 transport high availability features. Microsoft Exchange Server 2013 is the latest and greatest version of Exchange server today and be honest, it certainly looks great. At one point you most likely want to migrate from an earlier version like Exchange 2007 or Exchange 2010 to Exchange 2013. Major difference in Exchange 2013, but what does it take to actually move? Autodiscover, Database Availability Group, (legacy) namespace, load balancing, hardware requirements and not to forget Public Folders are all items that you have to be aware of, and that have changed in Exchange Server 2013. In this demo-packed presentation, Jaap Wesselius, a six-year Exchange Server MVP veteran points out the major issues when moving from Exchange 2007/2010 to Exchange 2013. Still running on Exchange 2003? No sweat, we cover some of this migration as well. At the end of this presentation you should have a decent view on what it takes to move to Exchange Server 2013. Join us to learn about Exchange Server 2013 on-premises deployment and coexistence with Exchange 2007 and Exchange 2010 including planning best practices and feedback from customers who have already started their upgrades. Understand how Exchange Server 2013 architecture changes will enable more flexible network designs and what you need to know to start planning for your deployment and upgrade. This session discusses site mailboxes in the new Microsoft Exchange Server 2013. Site mailboxes improve collaboration within a team by allowing access to both SharePoint documents and Exchange email through Microsoft Outlook and SharePoint. We give an overview of how site mailboxes enhance user productivity and then dive into architectural design, implementation, and supportability considerations. 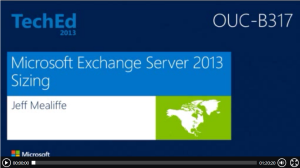 Public Folders in Microsoft Exchange Server 2013 are not the same as in previous Exchange versions. Public Folders are now called Modern Public Folders. Come and learn about the architecture and features of modern public folders. We talk about the differences between classic and modern public folders, how you can migrate them and what you need to consider before migrating your existing public folders to Modern Public Folders. Public Folders are now supported in Office 365. 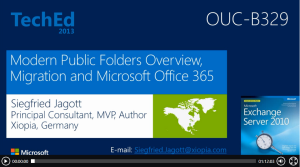 Come and learn what you need to consider to move your existing Public folders to Exchange Online in Office 365. Also, we share some best practices learned from working for a very large enterprise with 1+ million Public Folders. Don’t miss this session if you plan your own Public Folder migration soon. Tagged Channel9, Exchange 2013, Exchange 2013 sessions, TechEd 2013, TechEd, video. Bookmark the permalink.